Super rigid board. Doesn't flex at all. High-quality and a brand that backs it up. Reasonable price with different package options. Welcome to your most informative review of the Tower Adventurer 2. Not only do we test our boards, but we also do extensive research to make sure we don’t miss any critical points when reviewing our boards. 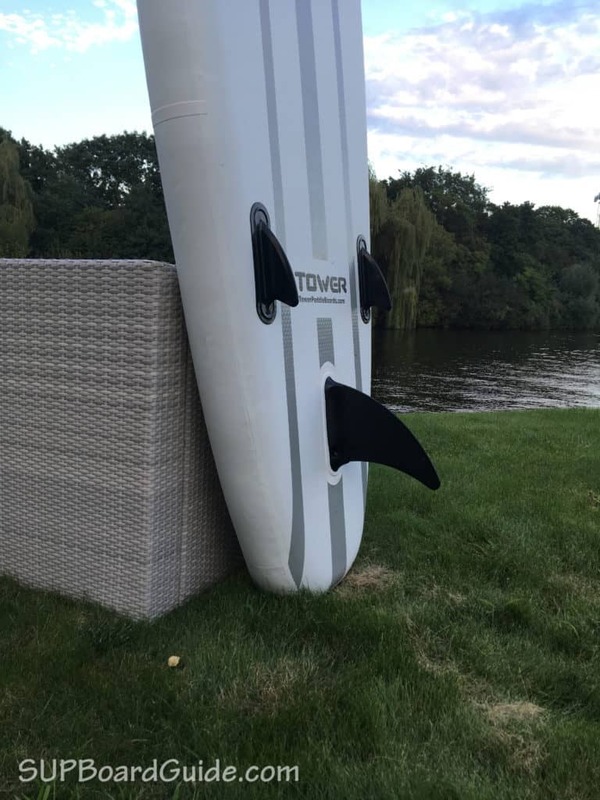 As far as inflatable cruiser SUPs go, the Tower Adventurer 2 definitely meets our high standards. With 80% success rate of getting 5 stars and the other 20% nearly all being 4 stars on Amazon, you don’t just have to take our word for it either. What a quick Amazon search won’t do though, is give you a FULL review, all the pro’s and cons so that you can be totally satisfied with your choice – before and after purchase. Let’s talk stability. The Tower Adventurer is likely to leave you feeling like you’ve become one with the water. You’ll feel super stable from the moment you hop on, even if you encounter a bit of chop or small waves. You’ll find steering your board a breeze also. We felt the difference in having a larger center fin, and it helps keep you in line and going straight, which aids to building momentum and fluid movements. Perfect for cruising! Why did they make a Tower Adventurer “2”? 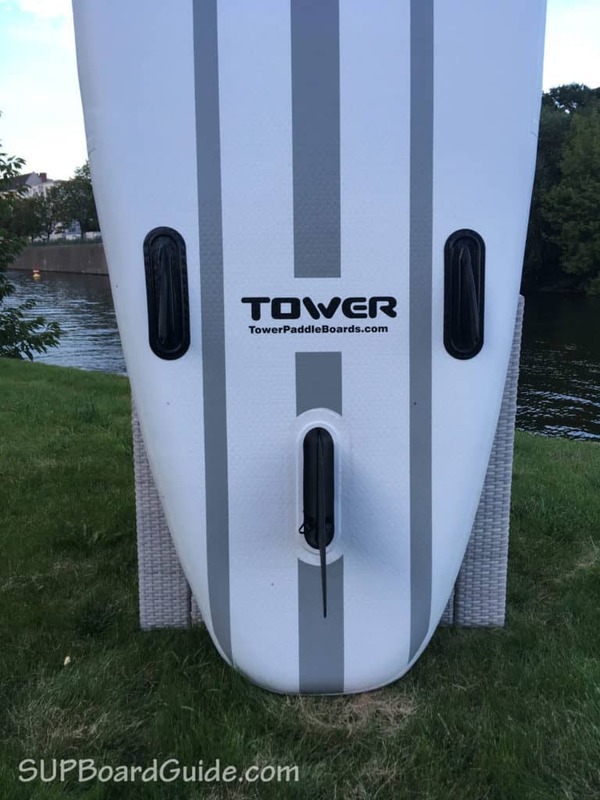 Well, the original Tower Adventurer is a great inflatable SUP for your cruising adventure. However, there was room for improvements. Here I’ll list them, keeping in mind this is the performance section, I go into detail about the added features down below. 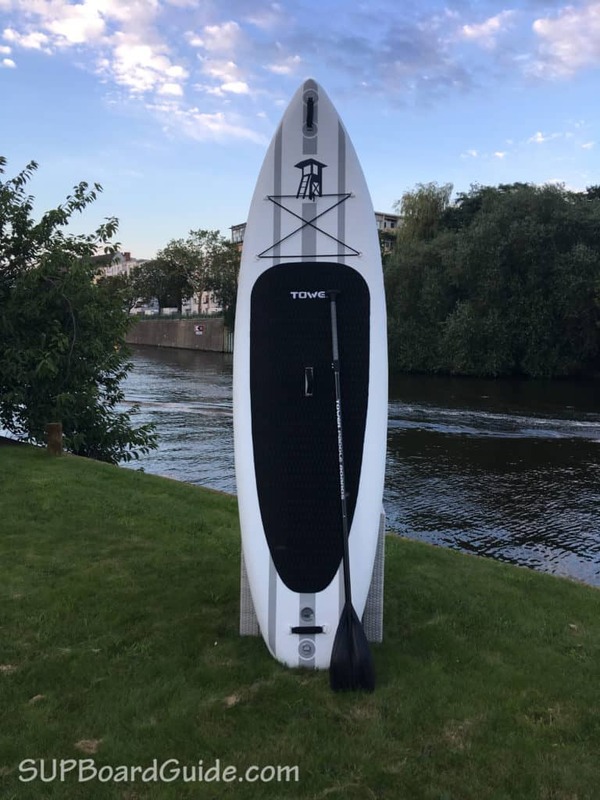 They are very similar in many ways however the Adventurer 2’s extra length and shape make it a better choice for bigger riders and/or any paddling being done in chop/small waves. That makes the board more appealing to advanced paddlers while still being as beginner friendly as the first version. The original board is still sold. However, it is only a few $ cheaper so I’d definitely get the Adventurer 2 instead of the original board. 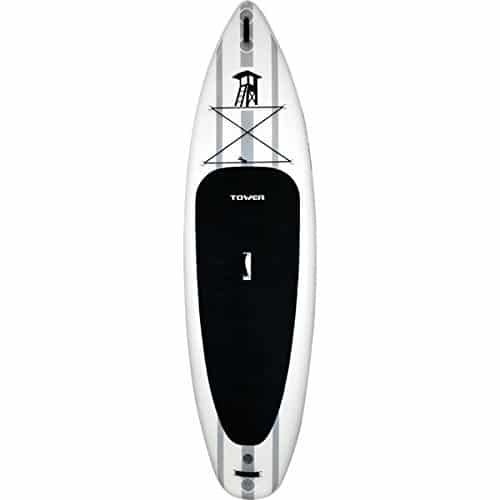 Your board is made from military grade drop-stitch PVC materials. The board is joined by thousands of robust threads stitched from top to bottom. To prove they mean serious business about the toughness of this board, Tower ran over a board with a car. Yes, a car. It didn’t pop, it didn’t even get a scratch. That’s proof enough for us! The board is also 6″ thick. That means it won’t flex and bend like thinner 4″ boards. The stiffness you get with the Tower board is definitely outstanding, and it’s something we already loved about the Adventurer 1. There’s a three fin setup with a large removable center fin. The fin is fixed in place by a small pin and can be installed in less than 10 seconds. It’s one of the standard fin setups you see in a lot of boards. If I had to complain about one thing, it would be the fin setup. While it’s a good setup for most people, advanced riders might want to play around with some different setups. Some competitors have three removable fins allowing you to use different fin setups for different conditions. For beginners, that’s not really interesting though. Tower decided to test the board by pumping it to 25 PSI, it held and was safe however it’s not recommended. 10-11 PSI is your desired pressure. Even though that’s below the 15PSI you see in most other boards, the Tower is just as rigid and stable at that PSI range. If you feel the need to, you can of course still inflate it to 15PSI. 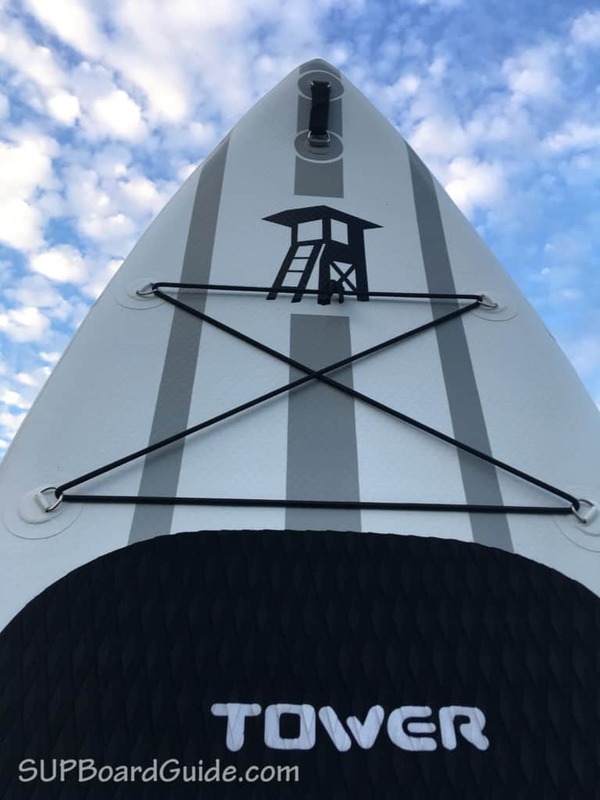 All SUPs have deck pads, the Tower Adventurer has a diamond grooved deck pad. It’s made of diamonds. It just means the grooves are diamond shaped which gives a sturdy grip and comfort. There are 4 D-rings on the nose that include bungee chords to safely store any items you’ll be wanting to bring on your SUP safari. This isn’t a necessary feature but does make a huge difference for doing long distance rides where you may need water, food, etc. The original Adventurer didn’t have such storage. We give it five stars for the extra handles on the nose and tail of the board, we found them incredibly practical for entries/exits. 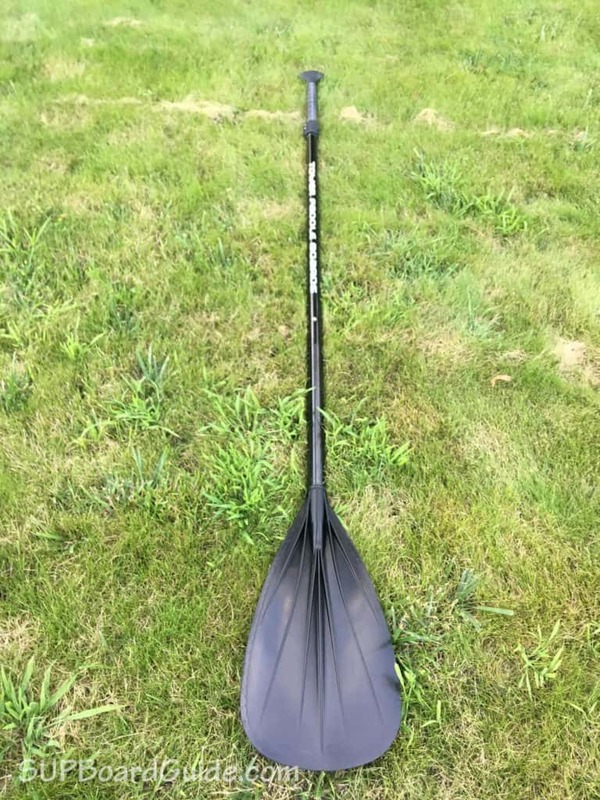 The paddle also packs down into three pieces. However, there’s no backpack included. You can purchase one separately, which is something you want to do. 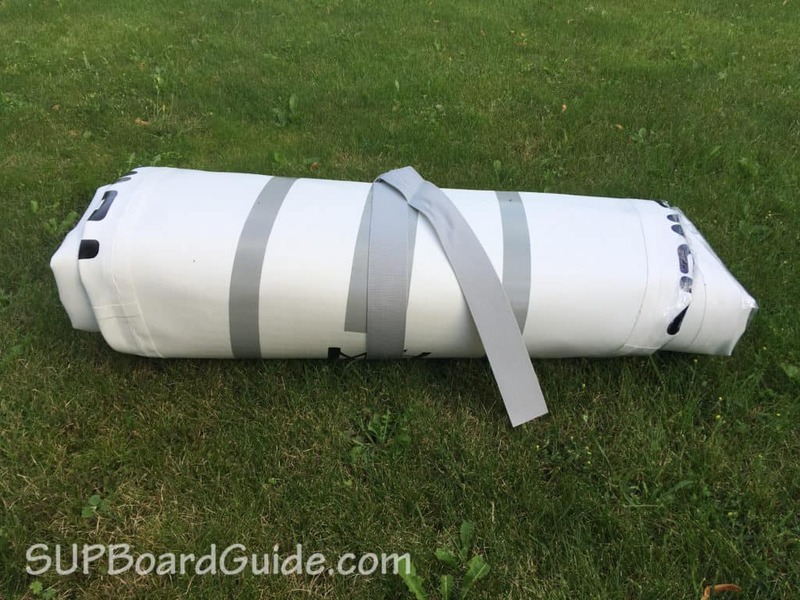 There is a strap to secure your SUP once it’s deflated and rolled up, but it’s inconvenient if you need to walk into any areas to launch your SUP. The reason Tower doesn’t include a backpack should be noted through. Instead of including a cheap backpack which you will never use or hate to use, they decided to make it optional. Since cheap backpacks are something we complain about all the time we tend to agree. Fibreglass is preferred over plastic! It can break down into three pieces and is adjustable from 65” – 85” so suits most riders. If you start getting more serious about your SUP-ing, we’d suggest looking to buy a separate paddle that will give you more oomph to your stroke. A leash is not included. Since it’s essential for safety, we’d suggest buying one. You can get a decent leash for $15-$20 on Amazon. We did not get to test the Tower backpack. At $60 it’s reasonably priced. One bag that’s even cheaper but definitely super well padded is the Thurso Surf backpack. You can find pictures over here or find it on Amazon here. Now as we’ve previously mentioned, Tower doesn’t just sell one bundle that includes all the extras you will need. 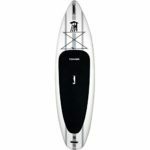 You can either buy just the board, the board including a pump and the previously mentioned fiberglass paddle or go for one of the limited edition boards like the Chris Craft Edition. Either way, you will most likely have to buy a separate backpack. 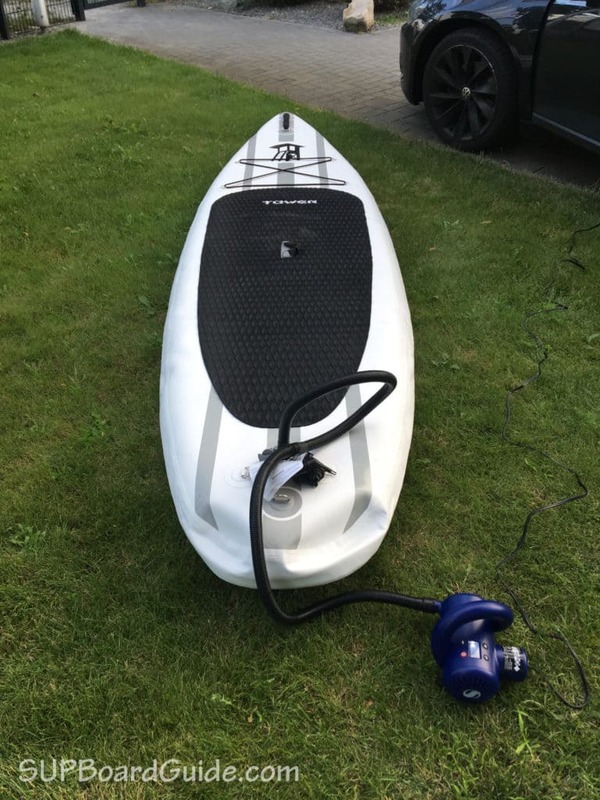 If you’re somewhat serious about paddling or already know that you will buy an electric pump buying just the board makes sense. At under $500 it’s extremely reasonably priced, and you can get yourself a high-quality paddle to accompany your high-quality board. There’s a bit to take in up there. So perhaps it’ll help if I just lay it out simple. Want an inflatable SUP that’s affordable and a breeze to cruise on? Do you want peace of mind knowing that Tower is one of the leading iSUP manufacturers and reviews all over the internet back that up? 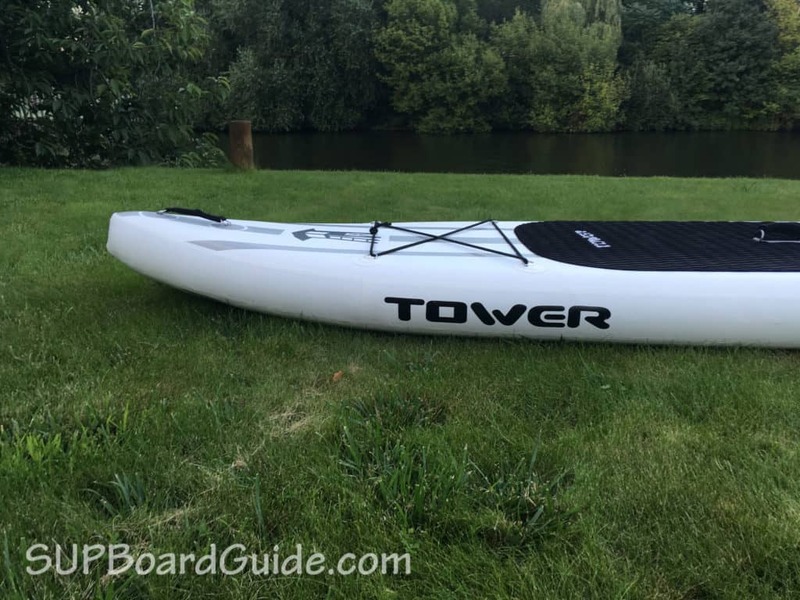 Go check out the Tower Adventurer 2. Want something a bit zippier? Check out the Thurso 11′. 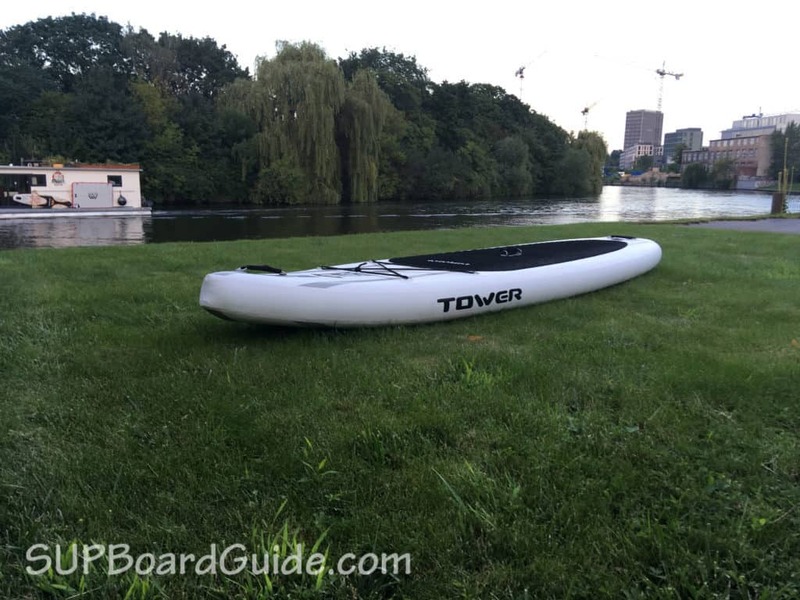 If you are happy and set on a cruiser that will be a dream to ride and paddle and portability won’t be a huge issue, then you can’t go wrong with the Tower Adventurer 2. There’s a 2-year Warranty on all Tower boards, and they have a great re-sell price because of their known durability. Can SUP Yoga Help You Lose Weight?